The year 2018 is coming to a close. Time for a brief review of what it brought us with respect to BlitzFight, and still will in December. The first major BlitzFight event for GM Oliver König and me was our further training in grappling in the USA in February. As on previous occasions, we were made very welcome. We trained with GM Gokor Chivichyan and his team for 10 days. Once again, we received a great deal of input which have already or will incorporate into our BlitzFight programme. 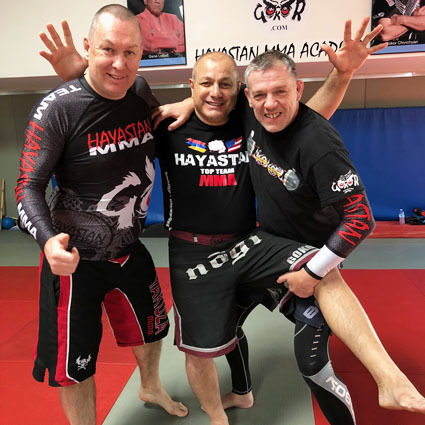 In October GM Oliver König and I flew to the USA for the second time this year to continue our further grappling training with Sensei Gokor Chivichyan in the Hayastan Academy in North Hollywood/Los Angeles. These were two wonderful weeks of training, working in groups with Sensei Gokor each day. We also took private instruction from him and his master students Harout Terzyan, Argam Asatryan and Karen Darebydian – all of them multiple MMA and grappling champions. Moreover, each of them is an outstanding teacher as well. Once again, this provided us with plenty of teaching material which we will use e.g. for further development of the programmes for Levels 9 to 12. 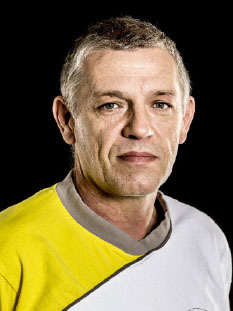 Techniques included leglock flows, takedowns and training drills, to name but a few. This will bring our qualified BlitzFight instructor training even further. 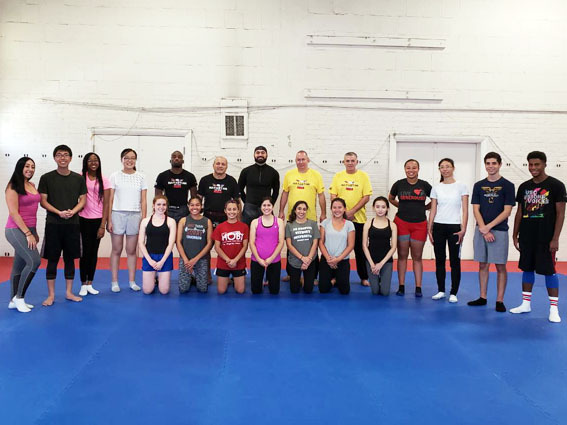 During our stay in the USA, GM Gokor and his son Arthur organised a self-defence seminar at the University of Southern California. We attended this as guest instructors, teaching suitable WingTsun solutions in standing positions. Whitsun was something of a home game for us, as GM Gokor Chivichyian came to Germany and thrilled the participants by giving three morning sessions at this year's Whitsun seminar. Accordingly, half of the Biddersbachhalle was covered with training mats to make the training as effective as possible. Apart from being very instructive, this also made plenty of sweat run. However, this discouraged neither Natalie nor Hsin, the son of GM Sam Chin, who took the opportunity to intensively try their hand at BlitzFight for three days. For them the afternoons were then dedicated to Xhong Xin Dao, which was taught by GM Sam Chin together with GM Kernspecht, with us as assistants. For GM König and myself, initial discussions with Sensei Gokor about our plans for the next Whitsun seminar in 2019 were also on the agenda. More details will follow shortly. 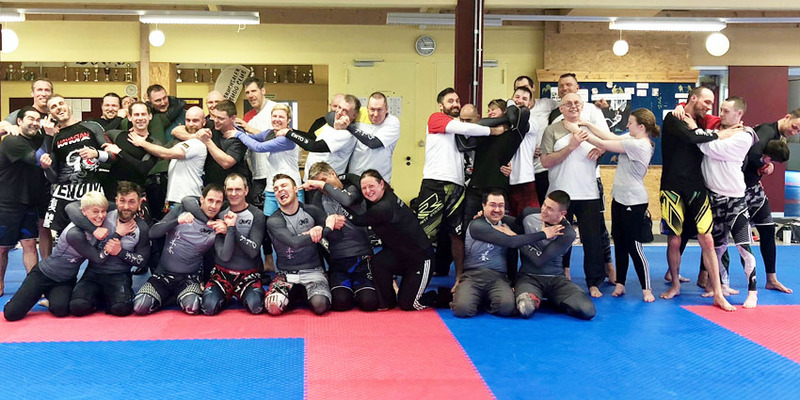 In October we were able to firm up our plans for BlitzFight seminars in Germany and Austria with guest instructors from the USA. a grappling seminar will take place in Munich with Master Karen Darabedyan. This should definitely not be missed, as Karen Darabedyan is not only among the world's best grapplers, but also an outstanding teacher who patiently explains and demonstrates every detail, and works personally with the participants – both with advanced students and beginners. That brings the BlitzFight year 2018 to an end, and it only remains for me to wish you a happy festive season and look forward to seeing you next year – whether at BlitzFight or WingTsun seminars.